Our definition of saving water needs to broaden to include strategies to keep water. This is especially true in our garden landscapes. While paving over grass with cement or replacing with artificial turf or stones saves water by reducing or eliminating the need to water, this strategy fails to KEEP any water, arguably more critical. 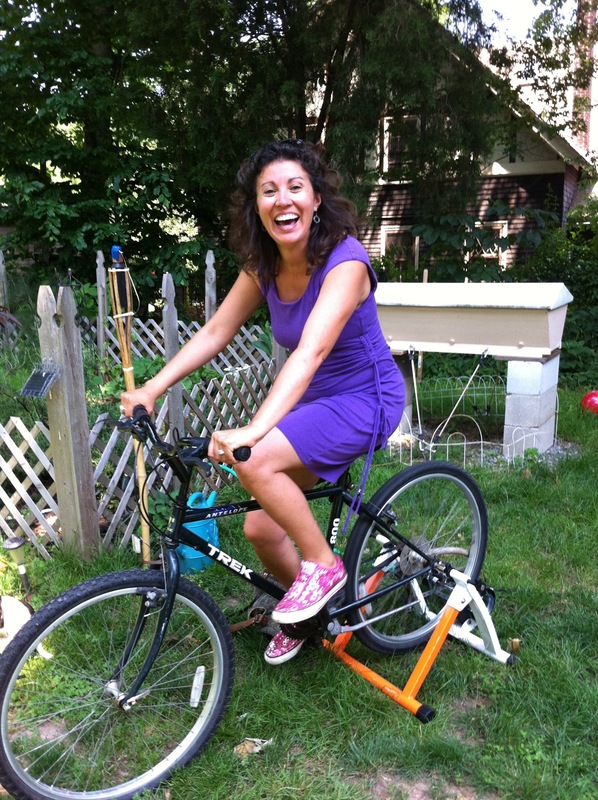 This bike powers the movement of captured water in a rain barrel. You get exercise and water the garden at the same time. Win-win. Currently, 2/3 of rain is lost to runoff and evaporation in urbanized areas. This includes farms treated with chemical fertilizers and pesticides that diminish the soils natural ability to retain water in comparison to soil with organic matter. I learned the best strategies to keep water from Lenny Lebrizzi, an expert in rain harvesting. We met in his small office nestled in an aging skyscraper across from New York City Hall in Manhattan before he drove me across the Verrazano-Narrows Bridge to his home garden in Staten Island. 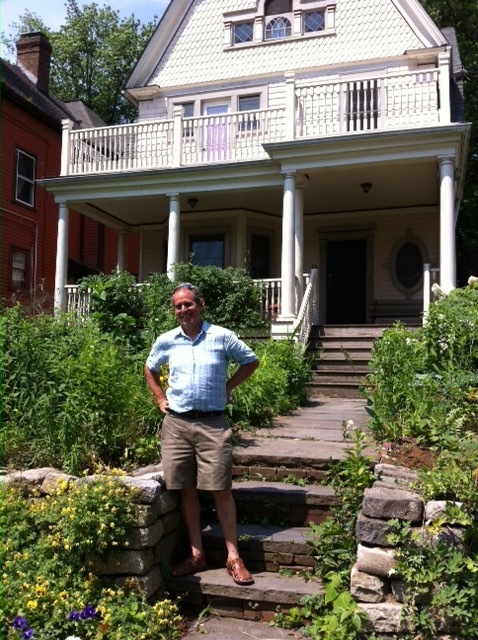 Lenny Lebrizzi, expert in rain harvesting, in front of his home in Staten Island. Lenny works for GrowNYC, a nonprofit organization engaged in greening the five boroughs of NYC. His job is to capture a portion of the 90 billion gallons of water that fall with every one inch of rain inside the borders of the largest metropolis in the United States. 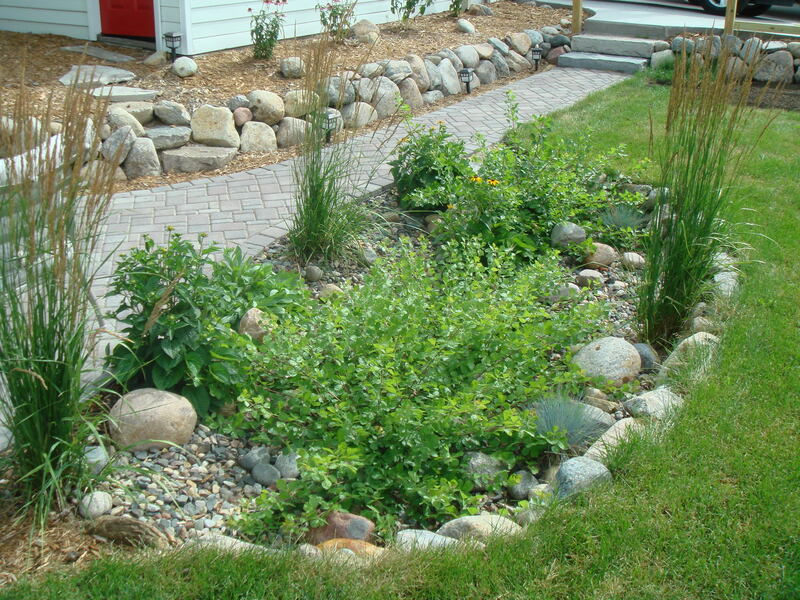 Rain gardens and bioswales are shallow ditches, landscaped with drench and drought tolerant plants. 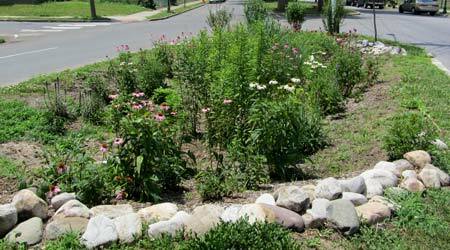 The bioswale is long and narrow while the rain garden takes any shape. Each is like pockets in the ground, designed to pool and slurp rainwater and snowmelt. Tree pits are carved openings in the curb. Rainwater enters thru the opening in the curb, collecting water around the tree and plants. In the United States, an area larger than the state of Ohio is paved with roads, driveways and parking lots and increasingly artificial grass. The rain glides across instead of through these surfaces, taking with it surface pollutants. Runoff between paved and unpaved surfaces are stark. In woodland areas, 95 percent of the water is absorbed by the soil. In urbanized areas where large swaths of exposed land are paved, the totals decrease to 50 percent. Water runs off these impervious surfaces fast, warm and polluted. We can all do better to keep water in our personal landscapes and advocate for improved designs at the municipal level. #1 Add Rain barrels. The roof collects 1/2 gallon of water per square foot with every inch of rain. Check to see if your water agency offers rebates. For information regarding the Metropolitan Water District rebate click here. 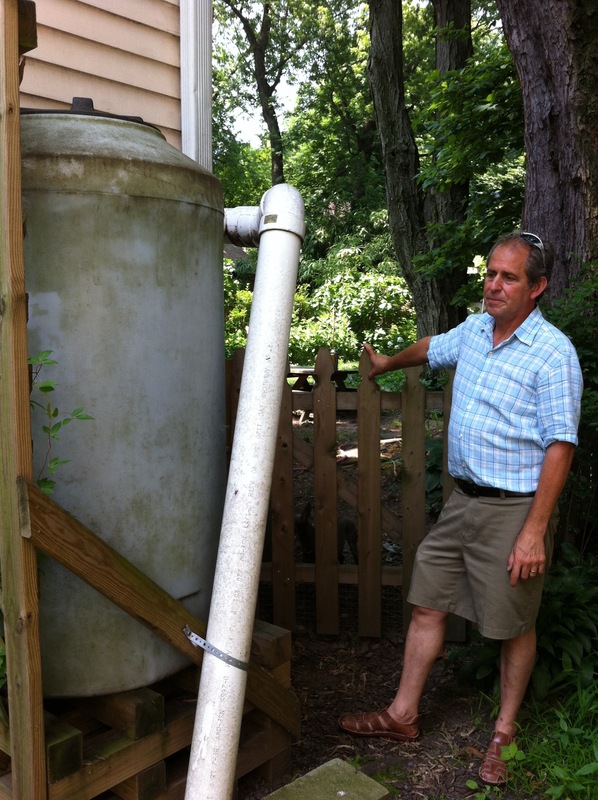 Lenny standing next to his 160 gallon rain barrel. 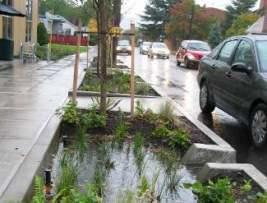 #2 Think Bioswale or Rain Garden. 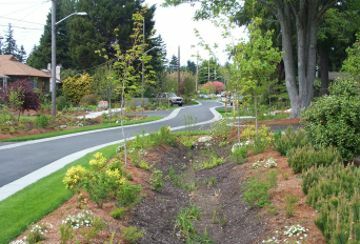 It’s time to move away from slopes and hills in both public and private landscapes UNLESS they feed into a bioswale or rain garden. These pockets or ditches created by bioswales capture rain and draw it downward to replenish groundwater supplies. Check to see if your city or water agency offer financial incentives to install one. You can easily find guides online to help you design and install your own. #3 Stop applying chemicals on your landscapes like fertilizers and herbicides. Chemicals kill the microbial activity in the soil. In other words, chemicals limit the soils ability to keep water. Our reliance on chemicals for soil fertility and weed removal has transformed our landscapes into quasi-pavement. #4 Add a Tree Pit. Tree pits are carved openings in the curb. Rainwater enters thru the opening, collecting water around the trees and plants. The cut out in the curb allows for water to flow into the swale during a rain event. #5 Grow plants in the ground instead of raised beds. Like potted plants, plants grown in raised beds are thirstier. Soil drains faster, and evaporation occurs on the surface and four sides. 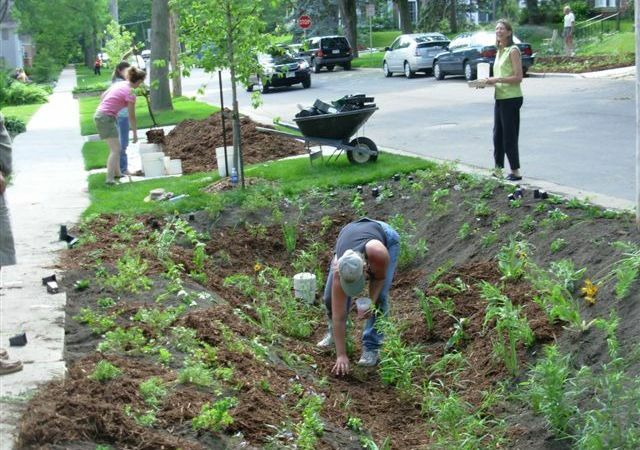 Raised beds are a great option if the soil is contaminated, but when possible plant directly into the ground. #6 Compost. Compost is beneficial to water systems on many fronts. Compost, rich with micro-organisms is a sponge for water. It absorbs 1/2 gallon per square foot of soil at a minimum. Compost lessens water pollution by diminishing or eliminating the need for chemical fertilizers and pesticides, instead bolstering the plant’s inbred resistance to disease and pests. #7 Plant Cover Crop. Cover crops is a technique organic farmers use to build nitrogen in the soil and can be used in your home garden too. Lenny scatters seeds of wheat or ryegrass over his vegetable patch after the growing season and turns the soil in his home garden in Staten Island. If he needs nitrogen fixers, he plants beans and clovers. When he’s ready to plant his garden, he turns the crop cover into the soil. The root systems of the cover crop feed the microbes in the soil, nature’s keeper of water. These are all excellent ideas. Im already composting and have a rain barrel. I’m going to check with the city to see about putting a cut in my curb, there is SO much water going to waste that could begoing into my garden. Keep more of these blogs coming!